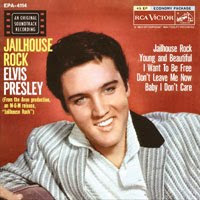 Those who bought the Jailhouse Rock EP when it was originally released in the autumn of 1957 must have thought their money well spent. And so do I, when it comes to the FTD edition, released 52 years later. This is what the Follow That Dream label is all about. Not only do we get the masters, alternate masters and movie masters together with some alternate movie masters and two bonus tracks. On disc two we're invited into the studio, given the opportunity to listen to Elvis and the band work their way through "Treat Me Nice" (takes 1-13), "I Want To Be Free" (takes 1-13) and "Young And Beautiful" (takes 1-22). Of course one can argue that some of the movie masters aren't that interesting, as Elvis had to sing half of the songs in different versions to be used in the film showing various stages of Vince Everett's development as a singer. One such example is the Florida club version of "Young And Beautiful," the first recording studio version of "Don't Leave Me Now" another. But that argument falls flat considering that FTD is a collector's label, and Ernst Jorgensen & Co should be given credit where credit is due. The fans want everything, right? This time we even get the movie opening theme, which is a first for a soundtrack album. And there is more to come, next year we can expect more outtakes and binaural sessions on Jailhouse Rock Vol. 2. I wonder what those who bought the original EP would've thought if they knew then how much material from these sessions would be released more than 50 years later? PS: Reading the FECC forum I found out that I wasn't the only one wondering why "Treat Me Nice" (splice of takes 10/13) is included both as an alternate RCA master (track 8) and as a movie master (track 22). Thankfully, a member on the same forum had the answer: the movie master has an overdubbed guitar.